Are you familar with Bluetooth speakers? In case you aren't, they're speakers that are wireless and connect with your device via, Bluetooth. Pretty nifty, huh? One of the leading Bluetooth speakers available in the market today is the Sound Kick by Soundfreaq. The original Sound Kick came in a basic black shell but the newly released chromatic version come in a variety of super hip gradient colors and a very modern white aptly named "Ghost". The color updates were done primarily to compliment the new Apple iPod Nano and Touch colors. Despite the obvious affinity to Apple products, the real beauty of the Sound Kick lies in its capabilty to work with ALL your gadgets, regardless of brand, age and sockets. They are built to grow with your changing gadget needs. Being a music freak/nut, I was elated to find out that I was one of the chosen bloggers to review this new product. Not only are speakers a pre-requisite in my household, they also need to deliver a good performance. The Sound Kick speakers come in a typical cardboard box. The speakers itself are protected by an extra cardboard casing similar to those used for eggs and Starbucks take out. Inside, you will find: a warranty card, quick instrucion manual, sound kick speakers, plug and earphone cable (so you can also use it with your old iPod videos and other similar mp3 players that aren't equipped with Bluetooth). After tearing away a few layers of packaging, you finally get to the speakers and I must say, they totally win me over at face value. I love the built and look of it. They're sleek yet feel sturdy enough to survive getting knocked over. It's made of high grade plastic (the type that doesn't crack easily). So if I were to judge these speakers solely on its appearance, it would receive flying colors in my book. But of course, it's what it actually sounds like that matters most. Watch out for my review, demo and video in the coming days. 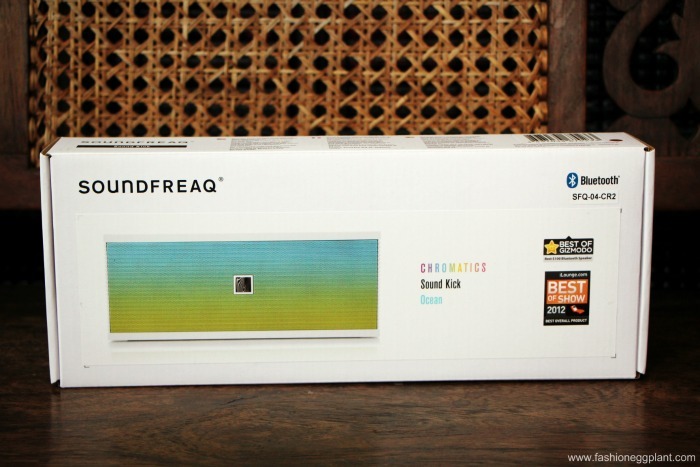 Soundfreaq Sound Kick speakers have an SRP of P4950 and is available at Beyond The Box. All speakers come with a 1-year warranty. Nice unboxing and great pics. Have you reviewed these speakers yet?